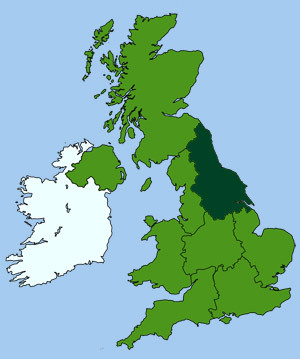 The Prince-Bishops of Durham once ruled the north-east from their Cathedral in Durham and from their castles in both Durham and Auckland. Durham is now a city of learning and the arts; its Oriental Museum being a treasure house of worldwide works of art. County Durham is bordered by Northumberland in the north and by the River Tees in the south. The western edge is crossed by the high ridge of the Pennines, with Hamsterley Forest stretching for some 5,000 acres across its central plain. The rivers Tees and Wear wind their way across the county, down from the Pennines between gentle hills, towards the abandoned coal fields of the eastern lowlands and the coast. 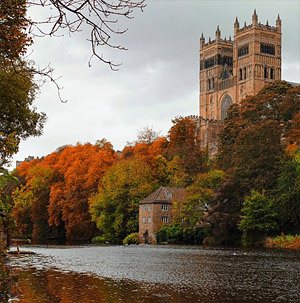 The River Wear encircles a small hill in the centre of Durham City, on which stands its cathedral and castle. Sir Walter Scott (1808), "Marmion"
Durham is unique being both a county and a town. First recorded in 1000 as Dunholme, a Scandinavian word meaning 'hill Island', later modified to its modern form by the Normans.